Long or short, thin or thick, chains are an important piece of bling to have in your jewelry box. Popular with men and women in the rap industry and on runways, quality chains that are made from gold are highly sought. Dressing up chains with a small pendant or cross can be symbolic of your faith and beliefs. Women and men can wear pendants on long or short woven chains. For men, dapper religious pieces look best with dress clothes like a crisp button down shirt, tweed overcoat, and dark jeans or slacks. For women, matching traditional Jesus jewelry to a skater dress, maxi dress, or summer dress will keep you on trend. Women love variety! Getting a range of types of earrings will help you match your outfits effortlessly. Try bold statement earrings and dainty Christian Jewelry that’s more beautiful and long lasting than plastic or costume jewelry. Thin or thick crafted rings have always been popular. Wear them with religious inscriptions, symbols, jewels or wear them as multiple rings, stacked, or sparsely. However you choose to wear them, make sure that they aren’t going to clash with what you’re wearing. If you have a bold patterned dress or have glitter or metallic going on, you’ll want to stay away from wearing too many rings. Bangles and chain bracelets are easily matched to varying types of outfits and can be layered just like necklaces and rings. If you’re wearing bangles you’ll want to wear a ¾ sleeve to show them off. 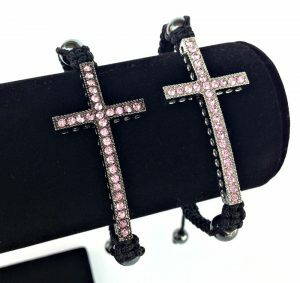 Flexible chain bracelets with a religious charm on them can look great dangling from your wrist or out from behind a sleeve or jean jacket cuff.